"A great sweet potato casserole recipe -- my children insist on this every holiday! Lots of miniature marshmallows, coconut and pecans make this an extra special and yummy Thanksgiving delight. Use fresh or canned sweet potatoes. Prepare the topping while the casserole is baking." Preheat oven to 400 degrees F (200 degrees C). Prepare a 9x13 inch baking dish with butter. In a large bowl, mash the sweet potatoes. Mix together with sugar, eggs, 3/4 cup margarine, evaporated milk, nutmeg, cinnamon, marshmallows and coconut. Scoop the mixture into the baking dish. Bake 20 minutes in the preheated oven, or until sweet potatoes are tender. 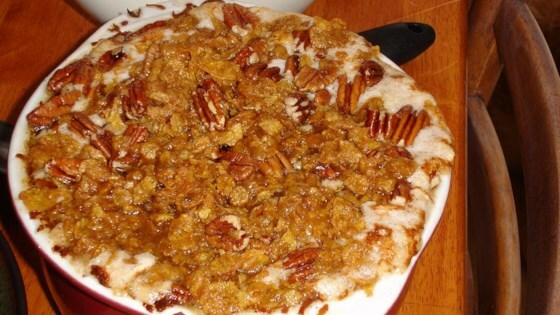 In a small bowl, mix the crushed cornflakes, brown sugar, pecans and remaining 3/4 cup margarine. Spread the topping over the baked casserole. Return the casserole to the 400 degrees F (200 degrees C) oven and bake an additional 10 minutes. Wonderful!I used canned sweet potatoes in syrup and cut the sugar in half! Thanks for sharing the recipe! I didn't really care too much for this dish. I thought it was too sweet. I think if I ever made this again, I'd not use as much sugar.